All transactions are safe and secure with a reliable history in online purchasing behind each of our associates. Buy the Growing Rebellion Mockingjay t-shirt to own Hunger Games clothing and merchandise. The design above was inspired by author Suzanne Collins' third novel in the trilogy, Mockingjay, which was first published on August 24, 2010. In the book, Katniss Everdeen becomes the "Mockingjay", a symbol of hope for the rebellion against the Capitol. The fictional bird originated as the result of the unintended mating of mutant jabberjays and mockingbirds. This Mockingjay t-shirt shows that you are not afraid to proudly display this soaring symbol of the rebellion. Add a Mockingjay pin or necklace to complete the look. 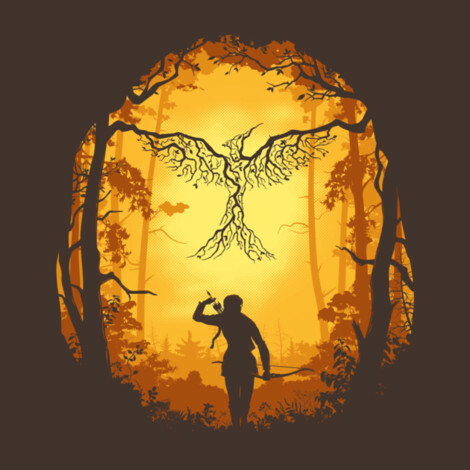 In addition to the Growing Rebellion Mockingjay tee above, browse the Hunger Games Clothing Gallery for more apparel like men's and women's clothes, kids shirts or hoodies.